Show off your family pride with this sweet Triplets in a Nest Necklace! 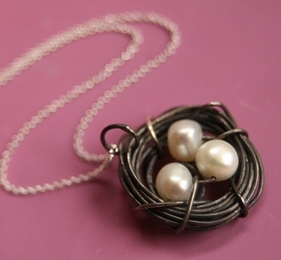 A sterling silver wire wrapped & oxidized nest cradles a trio of white pearl beads. It hangs on a sterling 16" chain. The clasp on the necklace is a handmade hook and eye. This piece is handmade, so expect some slight variation from the picture. A fun and very creative gift for a new or expectant mother of triplets! Comes packaged in a little gift box...perfect for gift giving!